Shopping online has almost become second nature to us – it’s convenient and a big timesaver. However, there are still some things that you’re better off buying offline or in speciality stores. Nowadays, you can have a so-called “eye test”, get a prescription for glasses, and even buy your glasses online. However, these online eye examinations can be extremely dangerous. Online eye tests are severely limited in their scope. Most of them just offer a refractive eye test and give a prescription for glasses or contact lenses based on that. Refraction is only one of the many tests that need to be performed during a complete eye examination. By itself, it doesn’t give a complete picture of your eye health, and basing your prescription on it is erroneous. It could even be dangerous, as this simplistic test doesn’t take into account other factors affecting your vision, nor does it diagnose underlying eye and other health problems. If serious eye conditions are left undiagnosed, they can lead to significant visual deterioration, permanent loss of vision or even risk to life itself. 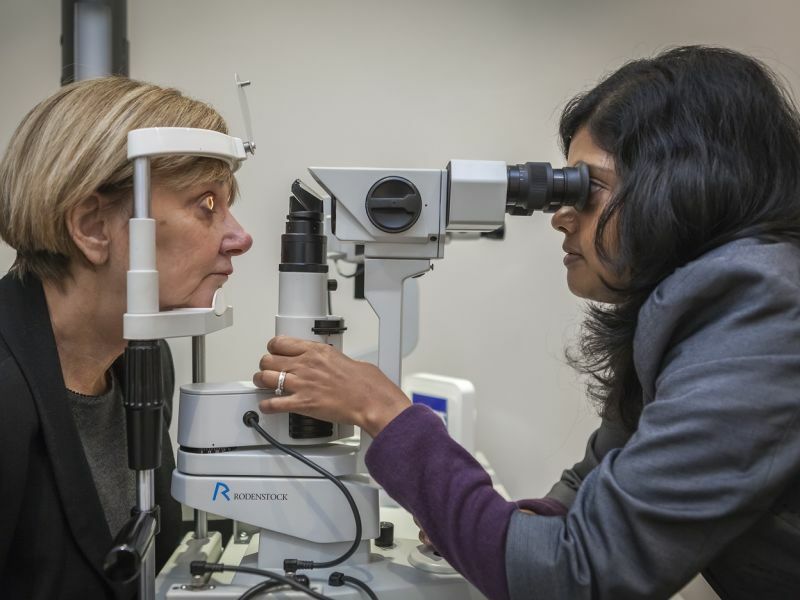 Unlike online eye tests, even the most basic eye tests carried out in person include the following, though there may be variations depending on your age and your eye conditions. These tests are quick, painless and non-invasive. Apart from these, more advanced eye tests can be done that can detect eye abnormalities and vision-threatening conditions in advance. Optical Coherence Tomography (OCT) is like an ultrasound for the eye. It shows a cross-section of the tissue layers of the retina. This allows your optometrist to get a complete picture of your retinal health. OCT can spot very early signs of glaucoma and macular degeneration. It can also detect hypertension and even diabetes (by detecting diabetic retinopathy). Digital Retinal Photography creates a digital image of the back of the eye, which can help in early detection of any retinal detachments, as well as other conditions such as glaucoma and macular degeneration. Optomap is an even more advanced digital imaging procedure than retinal photography, creating a panoramic image of the back of the eye and allowing the optometrist to see more than 80% of the retina. Instead of using online eye tests, getting your eyes tested regularly with an optometrist is essential for maintaining your eye health. At Leightons Opticians & Hearing Care, you will have a comprehensive eye examination, along with a complete lifestyle evaluation. Furthermore, should you opt to use our advanced screening techniques, we can fully assess your ocular health and identify any possible problems. Following your eye examination, your optician will be able to advise on next steps. This may be as simple as providing prescription glasses, or contact lenses if you prefer. If an underlying health issue has been picked up, they will be able to offer advice on the best course of action to help address the problem. So avoid the online eye tests, and come and visit us in your nearest branch. You can book an appointment online or call us on 0800 40 20 20.